As Boeing rushes to address international concerns about the safety of its 737 Max jets, most Wall Street analysts are taking a wait-and-watch approach. The Federal Aviation Authority on Wednesday was the latest to ground the planes following the second deadly crash in recent months. They won’t fly again until Boeing updates flight-control software, a process the chairman of a House aviation subcommittee says could last for six weeks or more. Several airline operators around the world have already indicated that they’ll rethink their Boeing orders, raising questions about the company’s long-term outlook. The FAA’s decision to ground the jets came after new evidence showed the latest crashed flight, belonging to Ethiopian Airlines, may have faced the same issue as the aircraft that went down five months ago off Indonesia. The previous crash was linked to a software system on the 737 Max that was activated by an erroneous reading of data from a sensor and repeatedly pushed the plane’s nose downward. 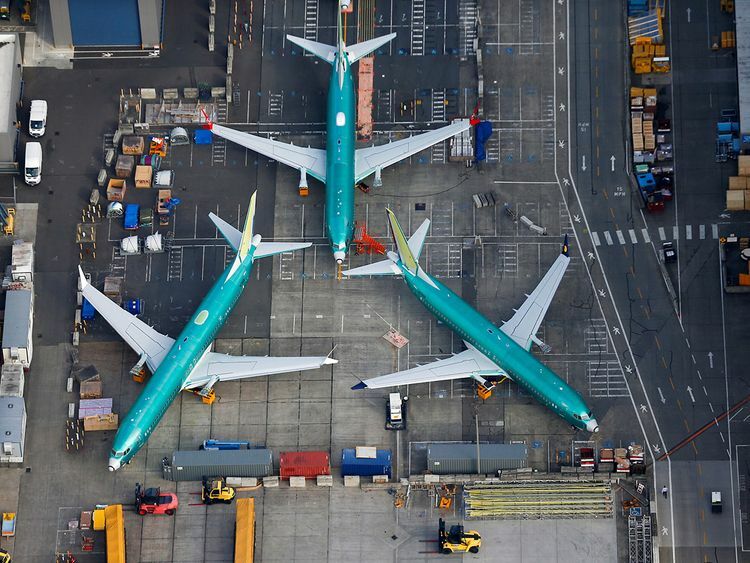 “We believe if the two crashes are found to be of a similar cause that is a better outcome for Boeing than if not,” Barclays analyst Julian Mitchell said. “We believe an additional discovery would likely entail a longer grounding of the aircraft.” Mitchell estimated Boeing’s monthly cash flow to be hurt by about $1.5 billion to $2 billion, including any potential airline penalty payments, assuming continued production of Max jets, but no deliveries. Boeing and the FAA have been finalising a software fix for the issue faced in the previous crash, and the company earlier this week said it planned to roll out the software improvements. “We see the financial risk for Boeing in three areas: there is the direct expense of implementing the software upgrade that has been discussed; there is the near-term risk from delivery delays and progress payments on in-progress aircraft; and there is the potential compensation for airlines and leasing companies for service disruptions,” Canaccord Genuity analyst Ken Herbert wrote in a note. Herbert said the best-case scenario for Boeing would be a grounding of six to eight weeks, and estimated the cost of the software fix to be around $500 million. Of the 29 Boeing analysts tracked by Bloomberg, only three have downgraded the stock this week. In all, the company has 21 buy recommendations, six holds and two sells. The average 12-month price target of $439 implies a potential return of 17 per cent from current levels. Boeing shares, which were up 37 per cent this year until the March 10 crash, have dropped nearly 15 per cent this week. Its suppliers have fared better, though they have also been beaten down. Spirit AeroSystems Holdings’ stock has fallen nearly 7 per cent after the accident, while Triumph Group is down 11 per cent and Hexcel Corp. is down more than 5 per cent. However, barring any major structural issue found with the aircraft after investigation, Boeing suppliers are not expected see a significant impact. “We see no near-term financial impact to the supply chain as we expect supplier deliveries to Boeing to continue uninterrupted unless the grounding were to extend for a significant period (more than 3 months),” Barclays’ Mitchell wrote.